Examining the organization of everyday life inside the regiments of the French Foreign Legion, this book takes its theoretical point of departure in the notion of the voluntary total organization; that is to say, an institution that constitutes a geographically delimited place of residence and work in which inmates are voluntarily separated from the outside world, leading an enclosed, formally administered life. Informed by a modified version of Goffman's original concept of the total institution, A Sociology of the Total Organization untangles the Foreign Legion and the ways in which different kinds of social orders interplay there. With a focus on regimental life, the author characterizes the armed forces not only as a total organization, but also as a greedy one, seeking undivided loyalty and the incorporation of all social roles within its bounds. Against this understanding, the book draws on rich ethnographic work to develop the notion of atomistic unity, the ideal relational condition that exists in the military, in which individuals commit to a unit and articulate ties with individuals on an impersonal basis, grounded in the belief in a greater whole. 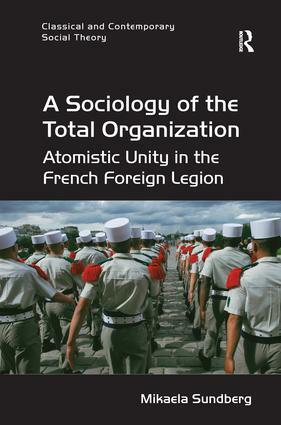 A detailed and empirically grounded study of the mechanisms in which the Foreign Legion not only cuts members' ties to people outside the organization, but also restricts the creation and maintenance of ties among its members, this book shows how atomistic unity is not limited to greedy organizations such as the military, but applies to a variety of collectivist settings. As such, it will appeal to scholars of sociology and anthropology with interests in military life, social relations, social theory and the work of Goffman. Mikaela Sundberg is Associate Professor in the Department of Sociology at Stockholm University, Sweden.